Length: 1 min, 24 seconds. Summary: Poor old peabrain. 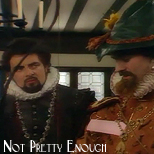 Lord Percy Percy/Lord Edmund Blackadder. Rated PG-13. Notes: Premiered at ConneXions 2005. Many thanks to the Evil IRC Cabal for smiling and nodding, and Magpie and Maeyan in particular for beta-patience and sage advice regarding the credits. ETA: And Tzutzane gets her toes kissed, for providing me with the source footage! Geez, I'm a putz. Words and music by Kasey Chambers. BlackAdder II footage copyright the BBC. Used without permission for personal entertainment only; no profit made.